Information about the nearest cultural event, museum or monument on your mobile phone, Personal Digital Assistant (PDA) or laptop is no longer something of the far future. ZaPPWeRK is initiator of Culture around the Corner and selected parties to participate in this innovative project. The service works via text messaging or, technically more advanced, the mobile portal Vodafone life! where "Steetguide" indicates the exact location of the nearest building of interest. 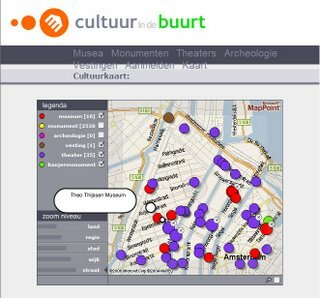 The website www.cultuurindebuurt.nl can be consulted via PDA and laptop. Whatever instrument you use the system retrieves your position automatically and matches your location with the location of the required place of interest.